"Smoked Reed" is dyed brown reed. It's called "smoked" because this kind of reed was originally colored by a process of smoking. *Please note that some sizes of Smoked Reed may be from different dye lots, and therefore, not the identical shade of brown. 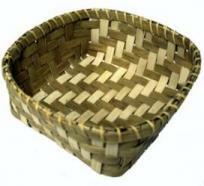 We are proud to offer our customers Superior Quality Basket Weaving and Seat Weaving Supplies at Reasonable Prices. No "seconds". No "slightly irregular". No "slightly hairy". Remember our GUARANTEE: No questions asked. 100% money back guarantee. "If you don't get the results & quality that we guarantee, we'll gladly give you a complete refund of your full purchase price." #2 Smoked Round Reed - 1130 ft.
#3 Smoked Round Reed - 750 ft.
#4 smoked round reed - 510 ft.
11/64 smoked flat reed -420 ft.
3/16" smoked flat reed - 400 ft.
1/4 smoked flat reed - 350 ft.
3/8 Smoked Flat Reed - 225 ft.
1/2 Smoked Flat Reed - 160 ft.
5/8 Smoked Flat Reed - 140 ft.
3/4 Smoked Flat Reed - 120 ft.
7/8" smoked flat reed - 100 ft.
1" smoked flat reed - 80 ft.
1/4" smoked flat oval reed - 232 ft.
3/8" smoked flat oval reed - 171 ft.
1/2" smoked flat oval reed - 86 ft.